In this QuickTake, we use data from the March 2016 and March 2018 rounds of the Urban Instituteâ€™s Health Reform Monitoring Survey (HRMS) to examine changes in consumer experiences with the Marketplaces, providing an update to previous analyses (Blavin et al. 2014; Zuckerman et al. 2014). How Do Marketplace Enrollees Get Information and Assistance with Plan Selection? 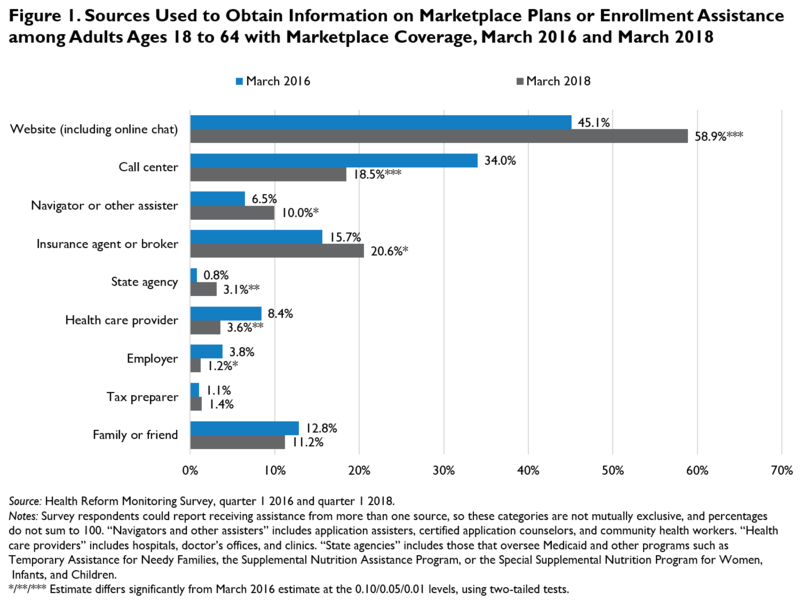 At the same time, the share of Marketplace enrollees getting help from a call center fell substantially, from 34.0 percent of enrollees in March 2016 to 18.5 percent in March 2018. Yet the shares of enrollees getting help from insurance agents or brokers, from navigators, certified application counselors, or other similar professionals, or from state agencies, increased. This finding is consistent with a recent Urban Institute analysis of 2018 Marketplace enrollment trends in five states, which found that certified application counselors and insurance agents played an important role in helping people enroll in Marketplace coverage for 2018 (Burton et al. 2018). Other research has found that people who receive personal assistance are more likely to enroll in coverage (Collins, Gunja, and Doty 2017). The most common type of in-person assistance that respondents reported receiving was from an insurance agent or broker. The share of Marketplace enrollees who reported receiving information or assistance from agents or brokers increased from 15.7 percent in March 2016 to 20.6 percent in March 2018 (figure 1). CMS has reported a similar trend based on enrollment data for the subset of states that use the federal Marketplace platform; it has found that the share of Marketplace sign-ups completed with the help of agents and brokers increased from 40 percent in 2016 to 42 percent in 2018.8 Though these trends are similar, the HRMS and CMS figures likely differ because CMS counts automatic renewals of plans that were previously purchased through agents and brokers as 2018 plan enrollments facilitated by an agent or broker; the HRMS may not capture this information. The HRMS also produces national estimates, whereas the CMS numbers only capture the experiences of the subset of states using Healthcare.gov instead of their own state-based Marketplace. According to the HRMS, 10.0 percent of 2018 Marketplace enrollees nationwide reported receiving assistance from a navigator or similar professional. This is notably higher than the less than 1 percent of Marketplace enrollees CMS reports received assistance from navigators in the subset of states using the federally facilitated Marketplace.9 The HRMS likely offers a fuller picture of the share of enrollees being helped by navigators or similar professionals because the survey estimates the share of people receiving any assistance, not just help enrolling in a plan. The HRMS question does not specify the activities that navigators and other assisters can help with, but survey respondents may receive many different types of assistance. For instance, in addition to facilitating enrollment, navigators and other assisters help consumers learn about where and how to shop for plans, how to determine if they qualify for a premium tax credit, what plan attributes may be important to consider when shopping for health insurance, how to determine if their current providers and medications are covered by a plan, how to use online tools to compare plans, and how to appeal a denial of coverage. 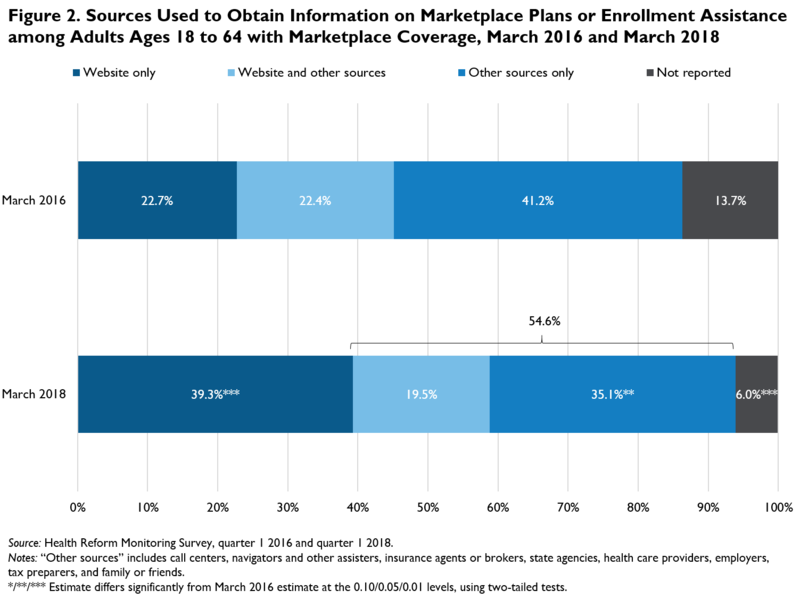 Taken together, more than half (54.6 percent) of adults with Marketplace coverage in March 2018 used a source of information other than a website when shopping for or enrolling in a plan. Only 39.3 percent of Marketplace enrollees used a website without any other sources of information or assistance, although this share was up substantially from 22.7 percent in March 2016 (figure 2). How Easy Do Marketplace Enrollees Find It to Shop for and Enroll in Coverage? 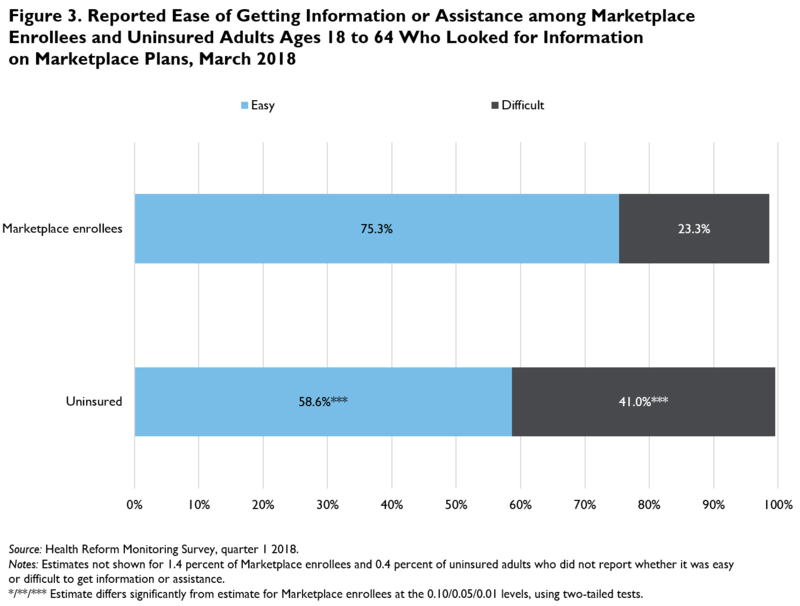 Three-quarters (75.3 percent) of adults who were enrolled in Marketplace coverage in March 2018 reported that it was easy to get information on plans or to get help enrolling in coverage the last time they looked for information or assistance. Meanwhile, among those who looked for information but remained uninsured as of the March 2018 survey, a smaller share (58.6 percent) found these tasks easy (figure 3). Overall, these findings suggest that consumers are increasingly enrolling in Marketplace coverage online, with 39.3 percent of Marketplace enrollees using a website and no other source the last time they looked for information or assistance. However, more than half of Marketplace enrollees still received information or some form of assistance beyond a website when navigating the plan selection and enrollment process, such as from call centers, navigators, insurance agents or brokers, or state agencies. These findings indicate that professionals in the public and private sectors who have the knowledge to guide people through the process of comparing and enrolling in plans remain an important source of information and assistance to those who use the Marketplace for obtaining health insurance, even as federal funding for Marketplace outreach and enrollment assistance has declined sharply in the past year and will decline even further for the coming open enrollment period. Blavin, Fredric, Michael Karpman, and Stephen Zuckerman. â€œUnderstanding Characteristics of Likely Marketplace Enrollees and How They Choose Plans.â€� Health Affairs 2016: 35 (3): 535–9. Blavin, Fredric, Stephen Zuckerman, and Michael Karpman. 2014. â€œObtaining Information on Marketplace Health Plans: Websites Dominate but Key Groups Also Use Other Sources.â€� Washington, DC: Urban Institute. Burton, Rachel, Rebecca Peters, Erik Wengle, Caroline Elmendorf, and Joshua Aarons. 2018. â€œWhat Explains 2018â€™s Marketplace Enrollment Rates?â€� Washington, DC: Urban Institute. Collins, Sara R., Munira Z. Gunja, and Michelle M. Doty. 2017. â€œFollowing the ACA Repeal-and-Replace Effort, Where Does the U.S. Stand on Insurance Coverage? Findings from the Commonwealth Fund Affordable Care Act Tracking Survey, March-June 2017.â€� New York: The Commonwealth Fund. Fung, Vicki, Catherine Y. Liang, Karen Donelan, Cassandra G. K. Peitzman, William H. Dow, Alan M. Zaslavsky, Bruce Fireman, Stephen F. Derose, Michael E. Chernew, Joseph P. Newhouse, and John Hsu. 2017. â€œNearly One-Third of Enrollees in Californiaâ€™s Individual Market Missed Opportunities to Receive Financial Assistance.â€� Health Affairs 36 (1): 21–31. ASPE (Office of the Assistant Secretary for Planning and Evaluation, Department of Health and Human Services). 2017. â€œASPE Research Brief: Health Plan Choice and Premiums in the 2018 Federal Health Insurance Exchange.â€� Washington, DC: ASPE. Zuckerman, Stephen, Michael Karpman, Fredric Blavin, and Adele Shartzer. 2014. â€œNavigating the Marketplace: How Uninsured Adults Have Been Looking for Coverage.â€� Washington, DC: Urban Institute. This QuickTake is part of a series drawing on the HRMS, a survey of the nonelderly population that explores the value of cutting-edge Internet-based survey methods to monitor the ACA before data from federal government surveys are available. Funding for the core HRMS is provided by the Robert Wood Johnson Foundation and the Urban Institute. The views expressed here do not necessarily reflect the views of the Robert Wood Johnson Foundation. The views expressed are those of the authors and should not be attributed to the Urban Institute, its trustees, or its funders. Funders do not determine research findings or the insights and recommendations of Urban experts. Further information on the Urban Instituteâ€™s funding principles is available at urban.org/fundingprinciples. Rachel Burton is a senior research associate, Erik Wengle is a research analyst, and Michael Karpman is a research associate with the Urban Instituteâ€™s Health Policy Center. The authors gratefully acknowledge the suggestions and assistance of Linda Blumberg, John Holahan, Karen Pollitz, and Stephen Zuckerman.